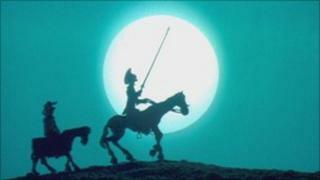 The Royal Spanish Academy has invited people around the world to record short chunks of the classic novel Don Quixote and upload them to YouTube. Miguel de Cervantes' Don Quixote is often described as Spain's most famous novel - and yet few have ever read it. Now the academy, the official guardian of the Spanish language, has divided the work into more than 2,000 segments. They will be read and recorded - in Spanish only - by volunteers visiting a special YouTube page. The academy said the campaign was aimed at promoting both the Spanish language and the famous book, which carried the full title The Ingenious Hidalgo Don Quixote of La Mancha. "The Spanish language does not occupy the space that it deserves on the internet," the secretary of the academy, Dario Villanueva, said. "We want to denounce that and do something to correct it," the AFP news agency reported him as saying. Written in 1605, the novel tells of the adventures of a retired gentleman from the la Mancha region who is obsessed with chivalrous ideas. The original boasts 126 chapters and is nearly 1,000 pages long. Those who wish to take part in the modern-day reading can sign up at www.youtube.com/elquijote. Each participant will be assigned a segment to be read on a video, which can then be posted online.